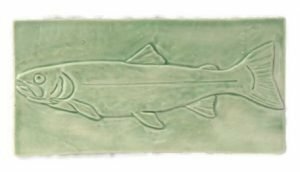 Bring your love of the outdoors into your home by adding this beautiful trout ceramic tile to your project. Fire Creek has several glazes to choose from to compliment any décor. Creating a backsplash, fireplace surround or bathroom tile installation will bring the serenity of a mountain stream to your home. We hand craft every tile just for you, so please allow 4-6 weeks delivery. Our tiles are made from stoneware clay for beauty and durability. You can have unique tile that reflects your personality. Choose Fire Creek Clay today! Are you looking for a way to remember that big catch? Perhaps you just love the woods, streams and fishing? Bring home this sweet trout and keep him in your fireplace surround, bathroom tile project or kitchen backsplash. Incorporating this beautiful tile into your tile project will bring the beauty of the outdoors into your home. Each tile begins as a slab of clay, hand carved and cast in plaster. Take a moment to read about our tile process. We craft every tile just for you, so please allow 4-6 weeks for delivery. We have several glazes in our shop for you to choose from. A variety of colors to match any tile installation and décor. We can help you achieve the look of your dreams. Do you still have questions? You can find the answers to our most frequently asked questions here. You don’t have to have the same tile as everyone else. Choose tile is that is unique and meaningful to you. Choose Fire Creek tiles today! Rooster 4 Inch Handcrafted Tile~Add a touch of country!